News - TBU Move Increases Synergy With SKF - Machine Support B.V.
B.V. Technisch Bureau Uittenbogaart (TBU) completed its move to new premises in Ridderkerk, the Netherlands, which the company shares with SKF Solution Factory - Marine Services. The move provides TBU with more space, a large showroom and workshop facilities, and also offers opportunities to increase cooperation with SKF. TBU is a long-standing Benelux distributor for Hamburg-based company Blohm + Voss Industries, which SKF acquired last year and renamed SKF Blohm + Voss Industries. In addition to other brands and products in its delivery programme, TBU provides products and services for SKF Blohm + Voss Industries. This product portfolio includes shaft components, stabilizers, steering gears, bilge water separators and environmental condition monitoring systems under the brand name SIMPLEX-TURBULO. TBU has a rich history in shipbuilding, maintenance and repair, representing SIMPLEX-TURBULO products as exclusive Benelux agent since the products were manufactured by the Hamburg yard then called Deutsche Werft. 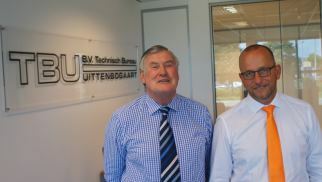 TBU Director Frits Uittenbogaart is welcomed to TBUâ€™s new premises in the SKF building in Ridderkerk by RenÃ© Vermeulen, General Manager SKF Solution Factory â€“ Marine Services.